Zen Herbal Liniment contains clinically researched and effective natural herbal medicines to get you moving and active again. It is a fast and soothing liniment used in Traditional Chinese Medicine to provide joint and muscle care to relieve inflammation and pain. Zen Herbal Liniment may help to relieve the symptoms of arthritis, rheumatism, minor sporting injuries, fractures, dislocations, bruises, sprains and musche spasms. * Nourishment and healing at the specific site of pain. Each ml contains tinctures equivalent to dried: Panax pseudoginseng root 25mg Angelica polymorpha root 15mg Spatholobus suberectus stem 15mg Commiphora molmol stem bark resin 13mg Boswellia carterii stem bark resin 12mg Dipsacus japonicus root 9mg Arnica montana flower 1mg Drynaria fortunei rhizome 10mg. Each ml also contains: Mentha arvensis oil 100mcg, Cajuput oil 5mcg. Contains alcohol. Directions: Adults and Children - Apply to the affected area 1 to 4 times daily. Children under 2 years of age: consult a physician. If symptoms persist consult your healthcare professional. 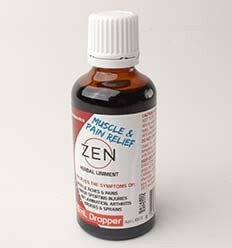 Can also be used with Zen Herbal Tablets for Optimal Benefits. Quality Standard: Zen is manufactured to the highest pharmaceutical standards in government licensed premises. Only the highest quality ingredients are used and are rigorously scientifically tested for identification, quality and potency.